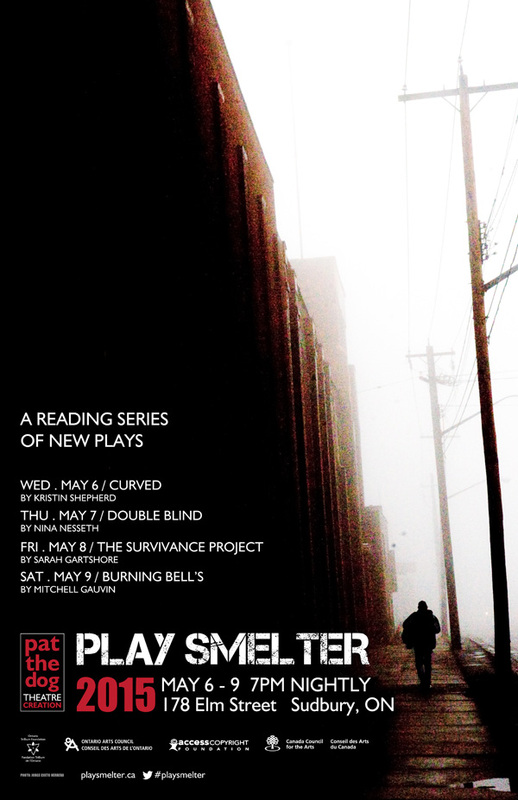 From May 6– 9 four new plays will be given their first readings in front of a live audience as part of PlaySmelter, Sudbury’s festival of new play readings. Homegrown writers Sarah Gartshore, Mitchell Gauvin, and Nina Nesseth will be joined by North Bay’s Kristin Shepherd in this initiative, produced by Pat the Dog Theatre Creation. The series, now in its third year, offers the rare opportunity for an audience to get their hands dirty by participating in the development of these exciting works-in-progress. Creators Eric Lapalme and Abby Yzereef will be receiving closed-door workshops of new plays this year, as well. All readings feature performances by local actors. “The theatrical work coming out of our region is outstanding,” says Artistic Director Lisa O’Connell. “This is a festival of Northern Ontario voices, receiving national attention.” Over the past few months, the writers have been hard at work preparing their plays for workshops with professional actors. This year, the festival is thrilled to offer a Master Class in Physical Creation by Trevor Copp, Artistic Director of Tottering Biped Theatre. Wednesday, May 6th – Curved by Kristin Shepherd. As the matriarch of a family suffers a debilitating stroke, the lives of five women crash together in this darkly comic drama. Thursday, May 7th – Double Blind by Nina Nesseth. On a school break, a young woman returns home to confront her family about her discovery that they have been using her as the subject of a scientific study. Friday, May 8th – The Survivance Project by Sarah Gartshore. Stephen Harper’s residential schools “apology” serves as the backdrop for this powerful piece about Canada’s Indigenous peoples, and the Canadians who live beside them. Saturday, May 9th – Burning Bell’s by Mitchell Gauvin. The burning of the Bell Mansion in 1955 is the inspiration for this wry and mysterious piece about a man searching for something he’s lost. All readings begin at 7:00pm at The Verve (178 Elm). Admission to each evening is Pay-What-You-Can (suggested minimum $10). Over the past three years, PlaySmelter has developed 10 original pieces by Northern creators, offered playwriting intensives for the community, and master classes with Emil Sher (author of STC’s recent production of Mourning Dove) and Colleen Murphy (winner of the Governor General’s Award). All dollars raised for PlaySmelter stay in Sudbury. This year, the Festival will again hire more than 30 local Arts workers over the course of a month, and all are compensated based on professional union rates.